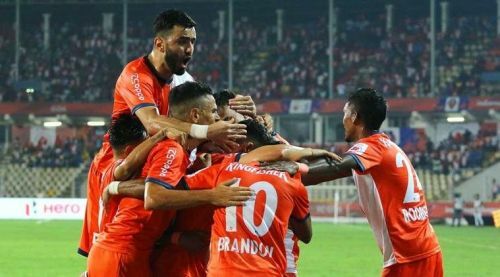 FC Goa go strong into the Indian Super League (ISL) semifinals after a 1-0 win over Chennaiyin FC at the Fatorda Stadium on Thursday. Going into the match, Goa only looked for a morale-boosting victory because the three points would not help them leapfrog last year's runners-up Bengaluru FC at the top of the table. Even though Goa have a better goal difference, the head-to-head record between two teams comes into play at the end of the league phase. The hosts did not have to do much as Chennaiyin FC looked dismantled and hopeless with the ball. The talismanic skipper Ferran Corominas scored the decisive goal for the hosts to secure a 1-0 victory over John Gregory's side. There was no real penetration for both the sides, but it was a fair reflection of the game as Sergio Lobera's men created plenty of chances through the counter-attack and scored the goal which mattered the most. On the other hand, John Gregory must be absolutely furious with the players as his side put in a heart-rending display with no grit and determination as well. It has been a complete miserable season for Chennaiyin FC who have secured just 9 points from 18 games. They will have Super Cup and AFC Cup to play, but it does not look like they will be able to bounce back if they do not improve their attitude on the pitch. Sergio Lobera will be absolutely delighted to finish in the top of the tree by putting in an extraordinary fight from the start of the season. In this article, we shall look at five talking points from the game between FC Goa and Chennaiyin FC. Before Corominas found the only goal of the game, Chennaiyin FC had three chances to go up through their striker Jeje Lalpekhlua. However, he was not able to take all three which came back to haunt the blues. During the first half, CK Vineeth linked well with everybody around him and played a through ball to the Chennaiyin No.12. The Indian International was able to find his feet out as his shot was too tame which helped the keeper Naveen Kumar to catch the ball with ease. The second chance fell when he took a nice first touch to settle himself, but the resultant shot only flew over the crossbar and Jeje was angry with himself. Had the 28-year-old been clinical in front of the goal this campaign, Chennaiyin would not have been in this much turmoil.